The Monarch Instruments NOVA-Strobe VBX Vibration Kit is perfect For Vibration Analysis and Predictive Maintenance Reliability Direct, Inc. Your Direct Source for Reliability, Maintenance, Test & Measurement! The Vibration-Strobe (vbx) kit has an operating range of 30 to 50,000 flashes per minute. Is uniquely designed to provide precise, instantaneous synchronization to a number of data collectors and FFT analyzers triggered by an accelerometer. The Vibration-Strobe (vbx) kit has an operating range of 30 to 50,000 flashes per minute. Is uniquely designed to provide precise, instantaneous synchronization to a number of data collectors and FFT analyzers triggered by an accelerometer. Built for portable applications, the vbx is the perfect lightweight phase analysis tool. 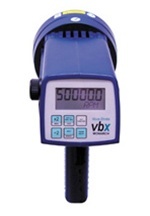 The vbx allows for the measurement of phase without stopping the machinery to install reflective tape. Phase analysis is quick and accurate using the Filter Bandwidth Selector and the Relative Phase Adjustment. Unique "Tracking Filter" maintains phase lock to input pulse. The vbx can power and be triggered by accelerometers with or without data collectors. Kit includes: Strobe, interface cable, universal power supply/recharger, spare lamp and carry case. Flash rates from 30 to 50,000 flashes per minute, adjustable in 1 FPM increments. The all digital, crystal controlled microprocessor keeps readings rock steady. Individual in and output TTL jacks for provides signal to remote data collector from accelerometer. Relative Phase Adjustment is user selectable allows reference mark to positioned at a convenient visual location. Backlit alphanumeric LCD display shows flash rate in flashes per minute.